Being busy is an understatement for Samantha Turbyfill. 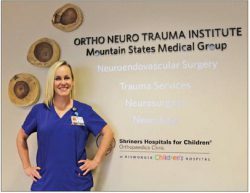 The Elizabethton native is the mother of two children and works at the Johnson City Medical Center as the head of the outpatient clinic for neuroendovascular surgery. With the loaded ­agenda, Turbyfill checked off an accomplishment by walking down the aisle on Friday, Dec. 9, during Milligan College’s Commencement, being part of the school’s first Adult Degree Completion Program for RN-­BSN. Turbyfill was able to have a breather Thursday. Her department, which works with stroke patients, had a busy day ahead with two brain surgeries on the docket. “After they leave the hospital, I do all their follow­up care,” Turbyfill said. “Make sure they follow up with their doctors, make sure they have somebody to call in case things start getting weird. Johnson City Medical Center has emerged as one of the top clinics in the area when dealing with patients battling with strokes. The development of medicine over the years has allowed patients that had a thrombectomy or cerebral aneurysms receive treatment in less stressful ways. While discussing different patients, Turbyfill added two patients were seen inside the clinic — one that had a thrombectomy and aneurysm fixed while another stroke patient didn’t require any surgery at all. Following up her time in Morristown, the proud Milligan graduate recalled the time when she heard the news about the school’s program to obtain the BSN. It was a joyous occasion once the phone call came in from Milligan College’s Jenny Duran. Turbyfill said the past two years was the best experience, talking about the experiences with her instructors and “Miss Jackson,” who Turbyfill added was the “sweetest and most helpful” woman ever on campus. Friday was a special moment to share with family members too, Turbyfill said, adding that she began to tear up when she saw her son, a sophomore at Elizabethton High School, receive a postcard from his first college. With a son in high school and a daughter that attends West Side, Turbyfill said she loves living in Elizabethton and sees the similarities between the community and Milligan College.